What Can Your Facebook Status Do For You? 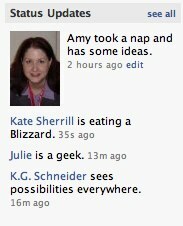 So, if you’re a facebook user like I am you probably know about the “status updates” feature. Quick story. I was in Princeton today to run a program that CJRLC held on Open Source with LibLime’s Nicole Engard. Afterward, I had the pleasure of going to lunch with some colleagues (including Janie). On our walk back to the parking garage, I was talking about how I need to go buy a new camera. Turning around, I saw our very own ROBERT LACKIE! (Phew! I was scared there for a moment!) We all had a good laugh and then tried to piece together how he had come to be standing right there behind me! So, you see, your online facebook status can have an effect in the “real” world! I update my facebook status on a fairly regular basis, and I know that sometimes people do notice it and sometimes do send me a message about it, but I usually really just do it for myself in a way. It never occurred to me that someone might actually apply it to the “real” world (which, I suppose can be good or bad, but that’s another post). But, you never know when something like this may happen and have bigger implications. For example, Nicole added her own story telling us that she once gave a colleague a ride after seeing their facebook status updated as needing a ride and being nearby! Others probably have similar stories of real life encounters with facebook status updates. So, what will YOUR facebook status do for YOU? Entry filed under: Facebook. Tags: Amy Kearns, Facebook. My facebook updates haven’t helped me yet, but I did have a similar experience. A friend of mine had a status that said they needed a ride because their car was in the shop. Turns out he needed a ride to a place right near my house. I called him up and was able to offer him a ride. He didn’t even know that I lived that close to the place where his car was!! Mine is not a facebook story, but rather a twitter story. I was collecting knapsacks for a local charity that gives emergency housing to women and children in crisis. Most of their clients are escaping an abusive situation and leave with little but the clothing on their backs. They need knapsacks, etc for the kids. I noticed that one of my twitter contacts was cleaning closets and had several new knapsacks to give away. I sent a tweet telling her that I would pay for shipping if she wanted to donate them to the shelter. Turns out she was going to be traveling near Princeton later that day and she dropped them off that afternoon! We had a coffee and a chat –and that was how I finally got to meet Julie Strange f2f after having been virtual colleagues via blogging and twitter. I too love it when my virtual life and real life overlap in such ways. Yes, Amy, it is just as you noted, and sorry for scaring you in the library parking garage! Great post, and it really was a pleasant surprise seeing you in Princeton, along with your colleagues for the day, especially when neither of us is from there. Your “digital self” post helped trigger my thoughts on the related topic of ID theft, so I am going to blog about that later today–thanks!